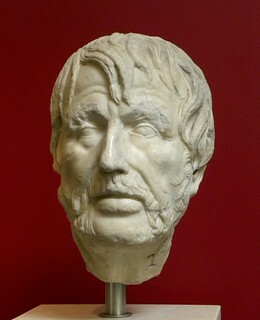 Portrait known as the 'Pseudo-Seneca' from the 2nd century AD. This portrait type is usually considered to depict a literary figure, perhaps Seneca (4 BC-65 AD), Hesiod (8th century BC), or the Latin poet Ennius (238-169 BC). National Museum of Rome, Palazzo Massimo.